Discount Garage Door Repair is ready to improve the functioning of your home’s garage door. Whether your garage door is not working properly or has stopped working entirely, our company of highly experienced professionals has the solution for you. If you’ve noticed that your door no longer opens and shuts correctly, it may be time to repair or replace its springs. Call us to get your door back in optimal shape with our affordable garage door spring repair in The Colony, TX. The role of the springs in your garage door is to provide the counterbalancing force that lets the door open and shut evenly. These components are some of the most active and important parts of the opening and closing mechanism. The springs undergo strong tension each time you use the garage door. When they break, your door no longer works properly, and often it won’t work at all. When you call us, though, you receive courteous professionals who do the necessary repairs quickly. The two components at work in your springs are extension and torsion. Extension strings expand as the door opens and then contract as it closes. 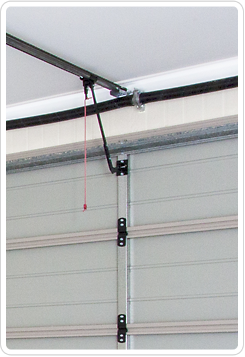 Torsion springs, on the other hand, utilize torque, or twisting, to counterbalance the opening and closing of the garage door. Whichever springs are at work in your door’s mechanical system, they are often under great pressure. This means that serious injury can result when they are not handled by trained professionals. Leave the job to us when you need spring repair for your garage door—we ensure that faulty springs are safely taken care of so you can once again enjoy an efficient and convenient garage door. Having a fully functional garage door doesn’t have to cost you a fortune when you turn to our company. We offer some of the area’s lowest prices on our prompt and professional repair services. When it comes to springs, count on us to do the job right and see that they’re properly installed and aligned. Our team’s unbeatable workmanship means that your garage door will perform at its best for years to come. With our industry-leading materials and fast repair times, we stand out as the company that offers superior service and value. Experience a higher level of customer satisfaction by making us your garage repair company today. Contact us for affordable garage door spring repair and replacement. We proudly serve customers in The Colony, Texas.